It had been going so well. The shopper, a grandmother looking for a holiday gift for her two grandsons, had decided to buy a Wii video game the boys really wanted: The Beatles: Rock Band. 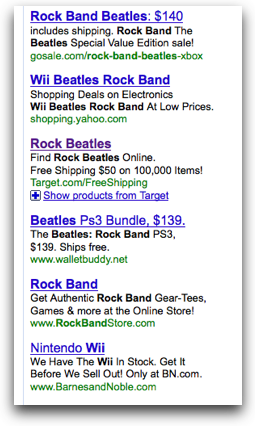 In Google’s search box, she typed “wii beatles rock band”, following the instructions the boys’ dad had given her, which produced many promising results. Being a loyal Kmart shopper, she was excited when Kmart’s site showed up in the sponsored listings and clicked on the link without any hesitation. 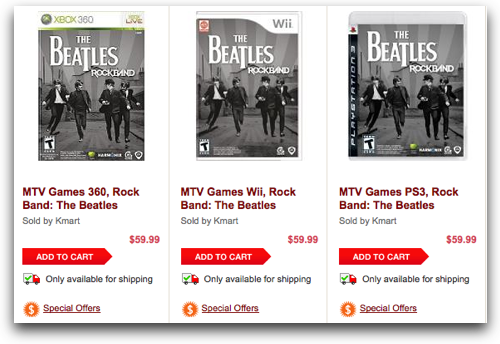 Kmart’s Landing Page for The Beatles: Rock Band. The shopper found multiple choices for her desired game, all looking remarkably similar. While the Wii version was right there, she chose the Xbox 360 version, because it was first. Later, she explained she didn’t know anything about video games. It never occurred to her that there would be different versions and she needed to carefully choose. We asked, what would’ve happened if we hadn’t stopped her? Turns out, she would’ve given the boys their gift, only to discover it wouldn’t work in their game system. Along with the immediate disappointment of not having a working present, they’d go through the frustration of returning and exchanging it. The whole experience was far from a positive one. The shopper specified Wii but got other Xbox & PS3 games too. Our shopper had made an honest mistake. After all, she specified that she wanted a Wii game when she typed the query into Google. Kmart seemed to understand other elements of her query. 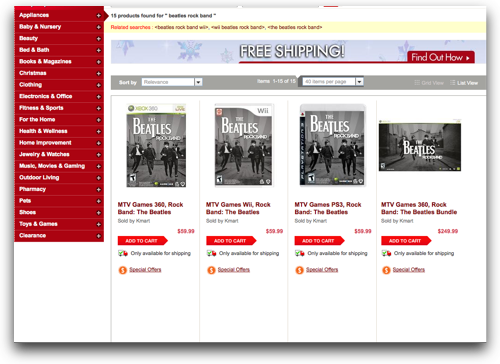 The site only provided the Beatles game, not any other variations of Rock Band or Guitar Hero or any other Wii games. The site, confident on every other attribute in her query, decided to waver on the platform, presenting a decision our shopper didn’t know she needed to make. Target also displays different versions of the game. Kmart isn’t alone with this problem. The same query picks up a similar result at the Target site. And, like Kmart, the Wii version, though specified in the query, doesn’t appear as the first choice—this time it’s the Playstation 3 version. Many sponsored ads barely matched the query at all. Part of this problem is caused by sponsored ads that aren’t matching the query. In the results our shopper received, only one from Yahoo! Shopping seemed to match the query directly. The others were taking liberties with one attribute or another. (Barnes & Noble’s ad was for Wii game systems—not the Rock Band game at all.) These companies are paying for clicks on ads, which are inevitably not producing great results. In the mild case, the user is abandoning after the click, only to hit the back button and go somewhere else—costing the site the cost of the unconverted click. However, in the severe case, like what we saw with our shopper, they make the purchase. The shopper is then left to wonder how things became messed up, while trying to fix it. This can only hurt that customer’s engagement with the brand and will rack up preventable customer service costs. 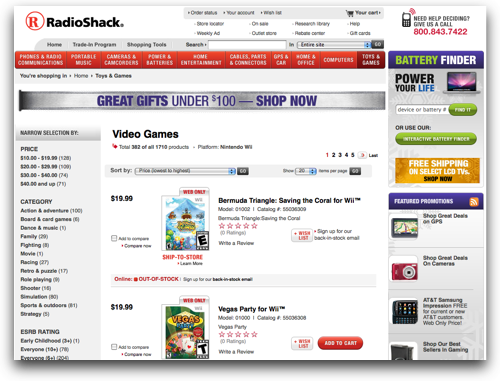 Responding to the query “wii games”, Radio Shack seems to have them all—1,710 games for the Wii. Radio Shack offers up 1,710 games for the Wii. A shopping site with hundreds of games is great—it’s nice to have selection. But how does someone choose? Had the shopper already had a game in mind, they probably would’ve typed some variant of the title into search. Yet our shopper typed in a very generic query—“wii games”. When we asked why he chose that query, he said he didn’t know which game he wanted and was hoping the site would help him choose. Radio Shack’s response is a list, in order by price, of all their games. It didn’t try to show the hot games, or the newest, unlikely-to-be-already-owned games. It left that up to the shopper, who was unequipped to make the decision. 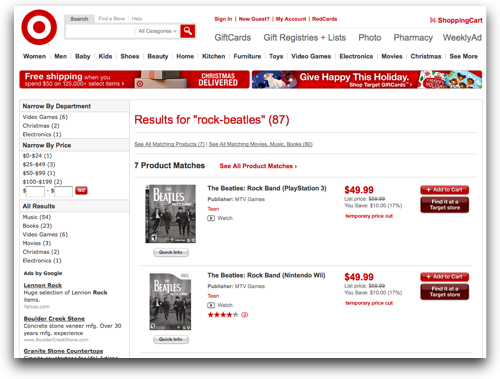 The result: the shopper left the site with an unconverted ad click, not happy with Radio Shack. Online Shopping isn’t the only place where we see issues with search landing pages. Recently, we met up with a gentleman who was considering changing careers to become a lawyer. As an engineer, he’d been filing bunches of patents and realized he found the legal aspects more interesting than the engineering portions. We were excited when we had the chance to watch him start his search for a law school in Boston, where he could attend classes in the evenings while keeping his day job. His search query was “law school nights Boston.” A reasonable query for someone looking for exactly those things. 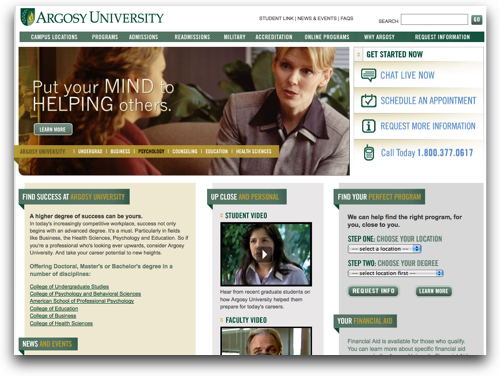 One of the first links to catch his attention was for a school called Argosy University. He commented that he was surprised, since he thought he knew all the Boston schools, and this piqued his interest. Argosy’s landing page has nothing to do with Law or Boston. Returning to Google’s search results, the next choice was an organization that sounded more promising: Lawline.com. 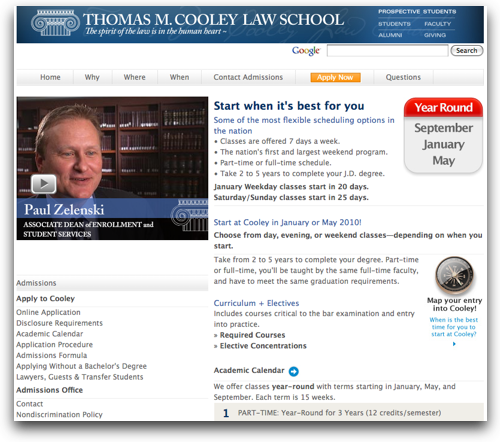 Lawline’s landing page isn’t for law school students, only lawyers. 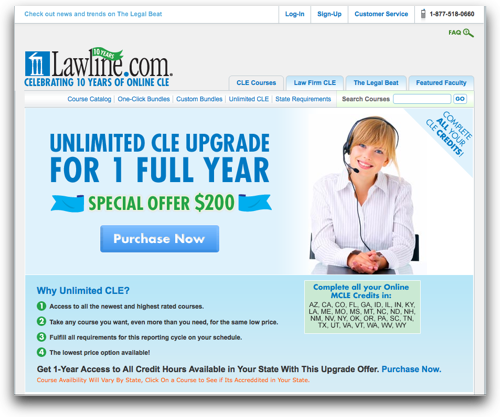 Unfortunately, Lawline only offers CLEs, which—though the site doesn’t tell you this—are continuing legal education courses, for practicing lawyers needing to renew their license. There’s nothing on the site for someone who wants to become a lawyer. Creating a successful landing page starts with asking the right questions. What is the query trying to tell you about the user? What are they looking for? Cooley.edu’s landing page almost does a nice job. It explains the school, when classes start, what the required and elective courses are, and how to apply—all the things someone considering a new education might be interested in. Again, the only problem is that Cooley isn’t in Massachusetts (even though their Google Ad implied they were)—they’re in Michigan. Any decent analytics program will tell you the queries that are coming into your site. The best teams regularly inspect the top queries, determine what those users are seeking, then check their landing pages to ensure they’re delivering it. They carefully prune out ads that are missing the mark, and they make sure they are getting the most for their search advertising dollar. Published here on December 15, 2009.